Star Theatres is located on 145 Sir Donald Bradman Drive, Hilton. It incorporates three performance spaces, two fully equipped theatres and a studio. All spaces are available for hire for a variety of activities and theatre applications. The theatre has a proud history of being a venue for hire to local productions of musicals, dance concerts, plays, exhibitions and more. We are proud to provide a easily accessible venue, at a reasonable cost, to support both local performers and audiences. ﻿In 1923 on land given to its first inaugural body, the theatre began its public life as a tin shed, and The Soldiers Memorial Institute which housed a library and meeting hall for returned soldiers from the first world war, was built. In 1928 a more permanent stone and brick building replaced the tin shed and formed the foundation of what still stands as part of the main theatre. During the early thirties functions like ballroom dancing and roller skating filled the hall, however roller skating eventually had to be banned because of the damage to the floor. In 1936 it became the home of a new fad ‘electric light cricket'. As suburban film theatres became popular, in 1937 an entrance foyer, ladies retiring room and a projection room was added to show movies and the building became known as ‘The Lyric Theatre' and then ‘The Windsor ' when it was bought by the Windsor chain. In 1956 and addition was made to the rear of the theatre to house a more modern larger screen however as movies were only shown on Saturday, the lease required the hall to be available to locals at all other times. During this time the hall became known as ‘Star Theatres' for a short period. Films were popular but when drive in movie theatres became established and television began in 1959 audiences dropped and finally the Windsor chain relinquished its lease in 1961. In 1962 John Edmund and Donald Grey took the lease and turned the main hall into a ‘performance in the round' theatre, which became the home of Adelaide live performances in the 60's…hence the name change to Theatre 62. While the library remained part of the theatre it was finally moved in 1970, when local council took over the management of the building as The Soldiers Memorial Institute was disbanded. 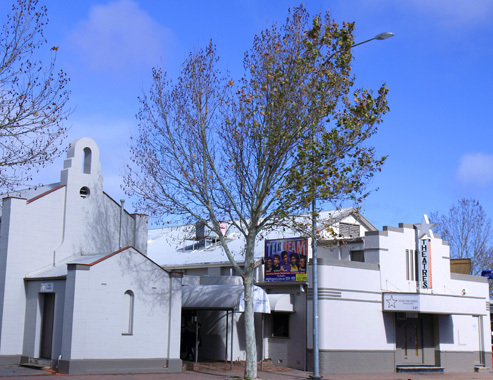 In 1985 the West Torrens Council refurbished the venue and leased to theatre to managers Barbara Messenger and Rob George, who continued the programming and promotion of ‘Local' theatre. Mighty Good Entertainment bought into the partnership in 1992 and eventually Malcolm Harslett became sole director in 1999. As part of an extensive up grade of facilities by Mighty Good Productions, it was noted that the name ‘Theatre 62' came from the year 1962 and had no relationship to either the address of the building or to the smaller venue, (known as ‘the Chapel') so it was decided to return to the name of ‘Star theatres' for the complex, with the main theatre being called Theatre 1 and the refurbished chapel, Theatre 2. In 2015 after several years of uncertainty the West Torrens Council voted to retain the theatre and continued the lease agreement with Mighty Good Productions for a further 10 years, later agreeing to budget upgrading the building for the future and to keep the venue which boasts an average audience of 80,000 patrons each year. In 2018 Mighty Good Productions has held the lease for 25 years, the longest time of any theatre managers and has produced 70 original productions since 1992. The theatres have also hosted hundreds of different clients from major Musical companies, comedians, plays and other theatre productions for many Primary and Secondary schools and Dance and Drama and singing schools. The theatre is also the home of the Mighty Good Talent School which in 2018 is celebrating its 40th year of teaching South Australians the performing arts.